WALK-IN 1160x1760x2000 mm - 2,94 mc. Without refrigeration unit. Composable . Dim. door 710x1740 mm. WALK-IN 1160x1760x2000 mm - 3,5 mc. Without refrigeration unit. Composable . Door dim. 710x1740 mm. WALK-IN 1160x1760x2360 mm - 3,52 mc. Without refrigeration unit. Composable . Door dim. 710x1900 mm. WALK-IN 1160x2060x2360 mm - 4,18 mc. Without refrigeration unit. Composable . Door dim. 710x1900 mm. WALK-IN 1460x1760x2000 mm - 3,83 mc. Without refrigeration unit. Composable . Door dim. 710x1740 mm. 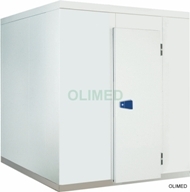 WALK-IN 1460x2060x2000 mm - 4,54 mc. Without refrigeration unit. Composable . Door dim. 710x1740 mm.